I’m sure I looked rather cartoonish, sitting on my overstuffed suitcase trying to compress and compact the goodies I had acquired over the weekend. I had flown to Chicago with a half-empty suitcase thinking there would be plenty of room for all the things I planned to buy at STITCHES Midwest. I brought nothing more than two outfits, a small knitting project, and my camera equipment, but somehow even with my suitcase’s extender fully unzipped, I was unable to find space for the bulging bags of fiber littering my hotel room. Good thing I was leaving Saturday afternoon… what would my suitcase situation have been if I were able to stay through the entire weekend? How did I wind up buying this much merchandise? My mistake was assuming that the STITCHES events were knitters-only. The stash in my craft room is so full of diverse yarns that I can easily stop myself from buying more because whatever it is, I probably already have it. I am content to look, not touch. But fiber… that’s another story. Put me in a room with spinning fiber and I instantly transform into Roger Rabbit trying to restrain himself from singing the last line of Shave and a Haircut. It eventually becomes an exercise in futility and I burst through the wall screaming “Two Biiiiits!” and hand over the contents of my wallet to the person at the cash register. I won’t go so far as to say that STICHES is a spinner’s heaven, but the event is definitely spinner-friendly. $8 for entry into the market is a bargain and I counted at least 10 booths with batts, top/roving, or locks for sale. (Let’s not discuss the price of my plane ticket, rental car and hotel room. $8=Bargain. That’s my story and I’m sticking to it.) Several sellers also offered needle and wet felting supplies. Allow me to backtrack a bit. Before you even enter the market, the first thing you see after making your way through the ticket line is the Xtreme stash wall. 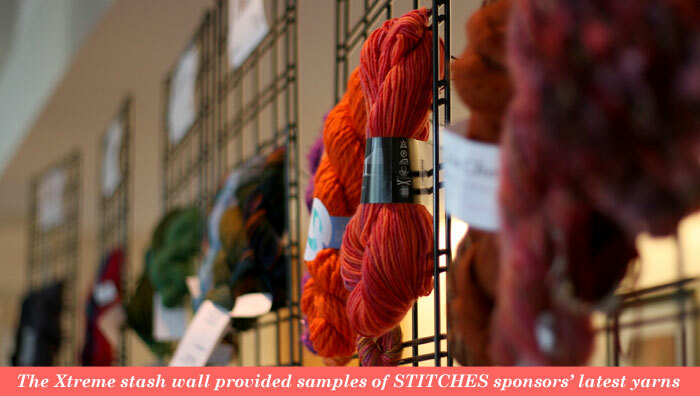 Skeins of the newest yarns & colors from STITCHES sponsors are neatly displayed with tape dispensers and an informational cheat-sheet. Any yarn that you’d like to remember, simply grab a strand and attach it to your paper. The stash wall is responsible for my newfound love affair with Symphony by Prism. 80% merino, 10% cashmere, 10% nylon, 5 sts per inch on a US 6. It has a nice sproingy twist coupled with intense variegated colors, reminiscent of Fiesta’s Boomerang. Once inside, you're presented with nearly a hundred vendors; yarn, notions, books and knitted projects as far as the eye can see. I had been warned that I might not be able to get to every booth in a single day, so I came prepared with a map. I researched each company beforehand and marked off each box on my paper in order of priority. This came in handy as I was able to zig-zag through and get first pick of merchandise, and after a short walk to unload in my hotel room, I was able to slow down and mosey through the second half of the day. The most memorable booth I came across was Esther’s Place, the retail outlet for fibers produced by the Illinois Green Pastures Fiber Cooperative. In addition to supporting a worthy cause, they also had a selection of products for sale that was right up my alley. It was difficult to decide between all the crazy-carded art-fibers and blended batts. My favorite products in all of the market were Esther’s needle felted flower kits, each containing everything you need (several colors of roving, matching locks, foam and needles) to make a beautiful flower pin like the ones displayed in the booth. Prepackaged kits such as these make it easy for a beginner to jump into a new medium without being overwhelmed by the task of inventing a project of their own. Creatively Dyed and Miss Babs had great selections of fiber braids. In spite of my serious case of I-can-dye-that-at-home-itis, I bought several colorways from both of these great ladies. Village Spinning and Weaving also did some damage to my budget; those sneaky devils had multi-packs of combed top in ROYGBIV-style color combos and I was powerless to resist. 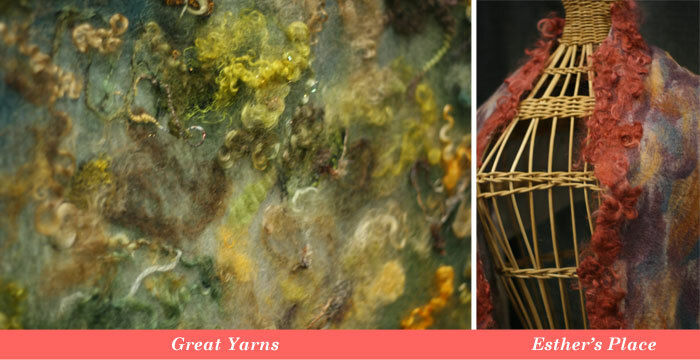 Skaska Designs and The Yarn and Fiber Company, among others, had a bin or two of hand dyed roving hidden in amongst the yarn. I am a lover of curly locks. It seemed everywhere I turned there was another scarf or fiber art fabric with locks incorporated into the design somehow. Great Yarns had stunning examples of felted fabrics on display as well as kits with silk scarves and all the baubles needed to create your own. Imagine Together, Shepherd’s Purse, Esther’s Place, The Bagsmith and Skacel also had beautiful lock-laden pieces on display. The awards for Best Booth Design and Best Knitting Pattern Designs go to Pick Up Sticks, hands-down. The effort they put into branding and corporate identity paid off in a big way. Opting for sage and cream striped backdrop curtains instead of the standard black, their humble little booth on the back row of the market was as perfectly put together as you would expect a stand-alone retail location to be. I felt like I was in an ice cream parlor, complete with felted maraschino cherries. In addition to the styling of the booth, their use of color and design put their patterns head-and-shoulders above their competition. All too often, companies churn out projects on an assembly line and rely on famous names or fancy photography to sell their designs. The unfortunate outcome is that the knitted garment or bag is likely to be the least cute thing on any given page, overshadowed by the model’s vintage outfit or the edgy interior design of the room she’s standing in. And we, as knitters, fall for it every time because our instinct is to stick with the medium we love best and disregard the fact that a certain design might look better in fabric than in yarn, for instance. It is clear that the designers at Pick Up Sticks actually design, and then translate that into knitted form, rather than relying on the standard easy-to-knit horizontal stripes and basic rectangles. They do not shy away from shaping, frequently incorporating circular shapes and appliquéd embellishments. Finally, many of their projects come in kit-form, meaning you don’t have to buy an entire 50 gram ball of red wool to put a cherry on top of your knitted ice cream scoop. The post-market fashion show on Friday evening featured garments from Swing, Swagger, Drape by Jane Slicer-Smith as well as designs by STITCHES vendors & sponsors. Slicer-Smith’s jackets are enough to make any southerner want to move to a colder climate. Several copies of the book were given away to enthusiastic crowd members, and the general mood in the room was one of excitement and anticipation. You could almost see the thought bubbles above each of our heads as we imagined ourselves knitting and subsequently wearing each new garment as they emerged from behind the curtain. 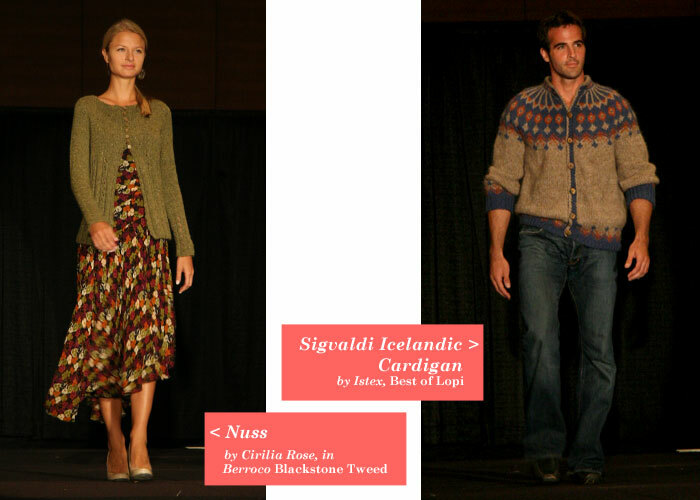 The predominantly female crowd went so bonkers at first sight of an attractive, male model that they hardly noticed the intricately knitted Icelandic cardigan he was wearing. Unfortunately, the introductions ran a bit longer than expected and I was unable to stay until the conclusion, but I’m sure all attendees left inspired and itching to cast-on for whichever designs caught their eye. My trusty camera and I are leaving for STITCHES Midwest today! I'll have a full review and tons of pictures to share when I get home.